Although its heritage is Spanish, like other cities whose land once belonged to the Mission San Gabriel, the city of Monterey Park’s present is firmly rooted in a growing Asian American population. With more than 60,000 residents, Monterey Park reflects the immigrant experience of Southern California with its dynamic community. In fact, about 48% of the city’s residents come from a Chinese background, which makes Monterey Park the municipality with the single largest concentration of Chinese Americans in the United States. Long ago, in the 1920s, developer Peter Snyder dreamed of building a lush garden community in Monterey Park that would rival the elegance of Beverly Hills and Bel Air. Though the dream never entirely materialized—on account of the Great Depression—what remains today are the lovely garden landscapes of El Encanto and Heritage Falls Park (more commonly known as Cascades Park because of its 70-foot, terraced waterfall). In the years after World War II, the city’s population grew and evolved: Within decades more Asian immigrants were coming to this part of the San Gabriel Valley to settle with their families. By the 1980s, in fact, the city was already informally referred to as “Little Taipei” and today you’re likely to hear Mandarin spoken in many of the shops in the city’s Chinese-dominated business district, which is found between Garfield and Garvey avenues. The mix of cultures in Monterey Park has resulted in a very fortunate situation for your tastebuds. You’ll find an exhilarating mixture of ethnic foods here, which has drawn praise from a host of food critics in various magazines and publications. Visitors find everything from standard American-style fare to Japanese, Thai, Korean, Salvadorian and Mexican food. The city’s robust commercial developments are situated along the main arteries of the city, including Atlantic Boulevard (which was also developed by Peter Snyder) . Monterey Park is so highly committed to nurturing businesses in the city that the Business Improvement District was established in 1986 to assist in that process. The city is bounded by three freeways on its north, south and west sides: the 710 Long Beach, 10 San Bernardino and 60 Pomona freeways. To the east is the city of San Gabriel. The estimated household income, according to a 2009 census, is about $52,000. The city doesn’t have a school district of its own, but serves its students with the schools of several neighboring districts, including Alhambra Unified, Montebello Unified and Los Angeles Unified. 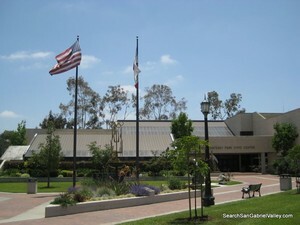 East Los Angeles College, a community college in the Los Angeles Community College District, is also located in Monterey Park.